‘Thinking back on our many years of cycling trips, I remember plenty of over-loved destinations. Not so with Norway. We waited until my wife was about to turn a major milestone birthday before going there. Fears of arctic isolation, $20 drinks, icy-cold weather and frequent rain turned out to be based in truth but greatly overdone. Surely we needed more clothing, and there was rain, but we were prepared for that. 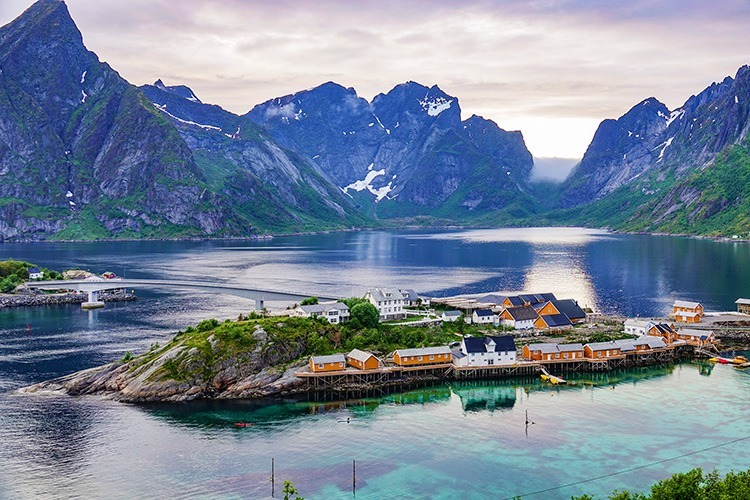 Plus, there is the Norway of Oslo and Bergen, then there are the Lofotens, a completely different world. 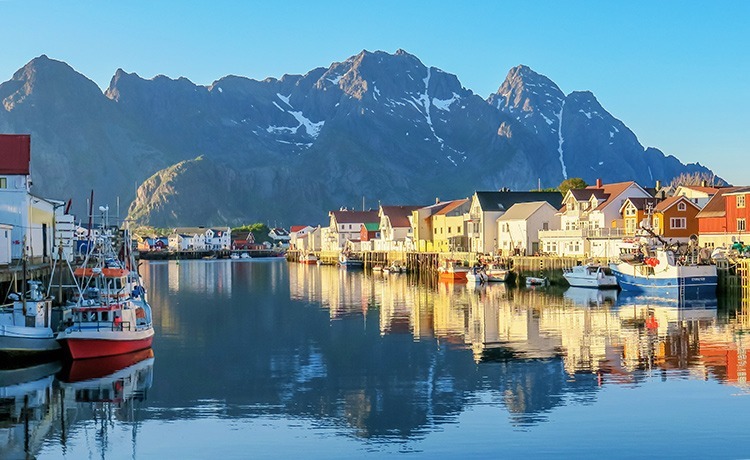 I’d read the Lofotens have the warmest weather for their latitude in the world, but what we got was far better than that superlative. Five consecutive days of full blue-sky sunshine with tee-and-shorts temperatures began our trip. 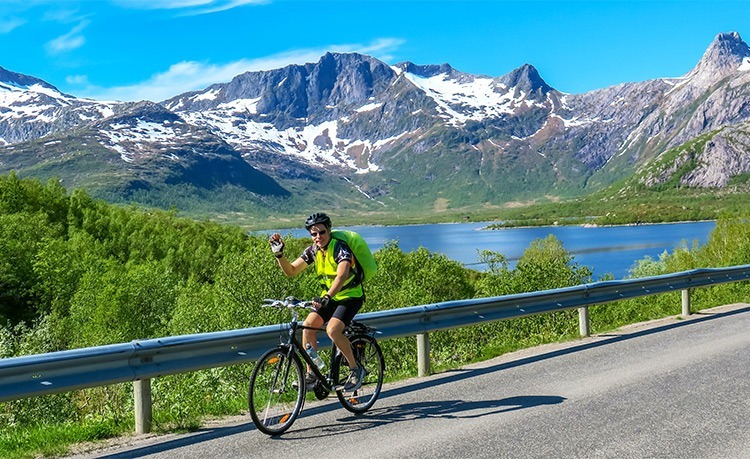 Our energetic, knowledgeable and boundlessly likeable Norwegian guide, Sandro, met us at the ferry arrival around 9:30 PM and took us to our accommodation where he gave us a briefing and our bikes, despite still having to drive two hours back to his home afterward. The sun had risen in early June and wouldn’t set until late July. This wouldn’t be a typical bike tour with turn-by-turn instructions and looking at the maps as much as looking at the road. There’d be no crowded tourist sites to try to book ahead, and no disappointments from waiting in any queues to see anything. 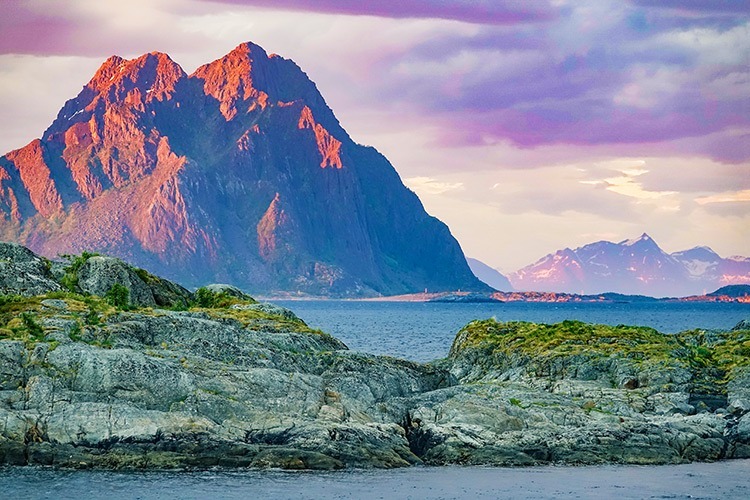 Most of the time, we felt like the only people out there seeing these beautiful fjords for the first time, along with a scattering of staunch locals who enjoyed the midnight sun but also endured the arctic winters too. Every day we were treated to towering snow-patched mountains, deep blue clear waterways, clean air, and the most pleasant accommodations we’d ever experienced on a bike trip. The overnights featured an ideal mix of self-catering and restaurant options. Any hill climbs were quite tame. Many of the routes had cycleways, including some very scenic bypasses around tunnels. Where we were on the main road, we found drivers to be respectful and careful of cyclists. 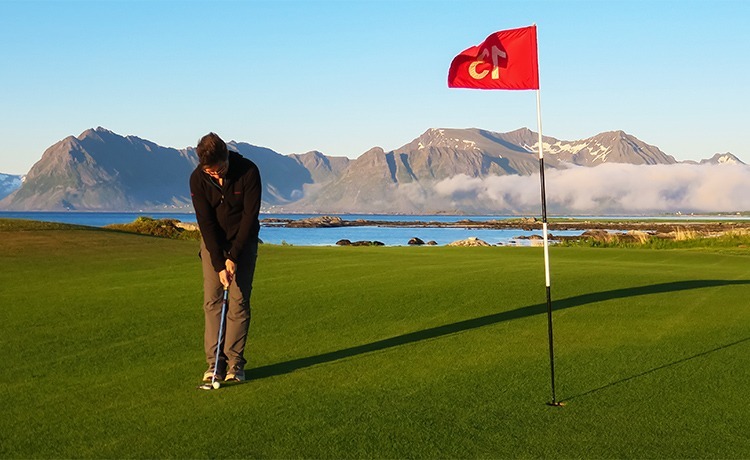 One of the highlights was a round of golf in the middle of the night at Lofoten Links. That was also our last clear day, with a light rain moving in the following morning. Still plenty of atmospheric low-cloud formations on mountains to see, and while the weather wasn’t the best, the sky would clear at odd times (like 11 PM), making for stunning late-night excursions up hills, above fjords, and through fishing villages with postcard views of the golden sunshine on the mountains and shoreline. It was a time to liberate oneself from the daily schedule and go with a different flow for a while. Feeling inspired? 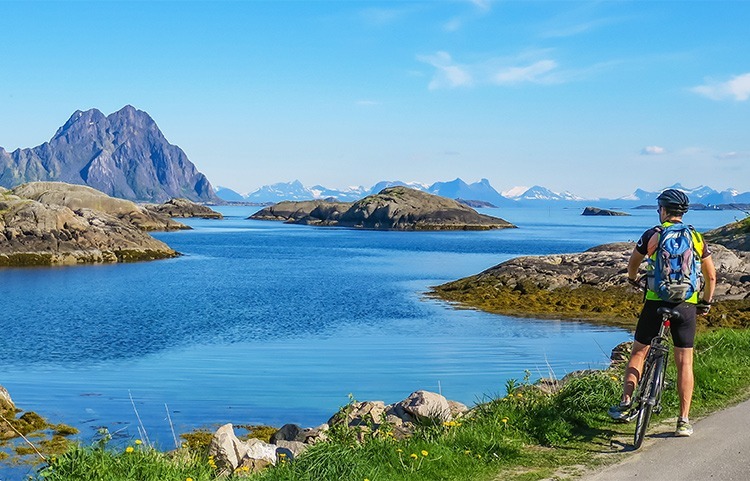 Check out our cycling holiday in Norway based on the breathtaking Lofoten Islands, whose dramatic, rugged beauty offers one of the most impressive natural landscapes in our leisure and family range!